I met a lot of interesting bloggers. For instance I got a chance to talk to Joe Walker, the author of DWR – an AJAX framework for Java – and Dave Johnson, the author of Roller – the blogging software that for instance runs most of the blogs at Sun and IBM (written in Java of cause). 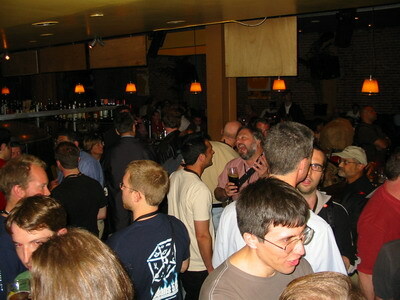 This entry was posted by Thomas Watson Steen	on Wednesday, May 17th, 2006 at 19:17 (GMT-1)	and is filed under Java, JavaOne. You can follow any responses to this entry through the RSS 2.0 feed. Both comments and pings are currently closed. I just have to add a little observation of the enclosed picture; where are all the girls?? Inspired by Rasmus’ comment, Your girlfirend has no need to be nervous about you. According to the photo, you’re in safe, geeky hands!